I had the privilege this past Wednesday to attend a lecture at the Bead Society of Los Angeles by archaeologist, Christopher B. Donnan, on the Moche beads of ancient Peru. What a fascinating presentation! Christopher Donnan, one of the world’s foremost authorities on the Moche culture of Peru, is a Professor of Anthropology at UCLA. Donnan has spoken at the National Geographic Society, the Smithsonian Institution, the National Gallery in Washington, D.C., The Metropolitan Museum in New York, and the Art Institute of Chicago, so we were thrilled to have him visit us. Christopher’s lecture included captivating stories and stunning photos which drew “oohs and ahhs” from the crowd of bead aficionados. The Moche civilization flourished on the north coast of Peru between 100 and 800 A.D. Although they had no writing system, they left behind, in the tombs of their rulers, a vast treasure of gold, silver and turquoise ornaments demonstrating superb craftsmanship and exquisite detail. 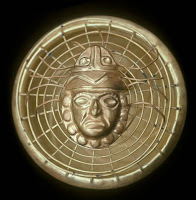 This elaborate adornment was reserved for the elite men and women of the Moche society. 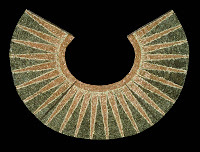 Found among the tombs were pectorals, bracelets, earrings and necklaces including a magnificent pectoral (pictured above as a reconstruction) of shell beads in narrow, triangular patterns with copper spacers. Many of the Moche ornaments were derived from nature and animals including images of catfish (thought to signify fertility and water), owls, monkeys and even spiders. And, often their beads were created with small balls/objects inside to make rattling sounds with movement–bringing the beads almost magically alive. Like ancient Egypt, the Moche nobility took their adornments with them to the afterlife so this ancient society’s need for these elaborate pieces must have ensured that skilled artisans were in high demand and constantly employed. This focus on the artistry of making ever increasingly beautiful adornments gave rise to the creation of some of the finest jewelry in the ancient world–and a glimpse of one of the most remarkable civilizations to inhabit the earth. A more comprehensive article and pictures on the Moche civilization can be found in a back issue of Ornament magazine (Autumn, 1993). A blog showcasing accomplished jewelry designers. Previous post: Bead Contest–Bead Star Challenge!